A great way for young children to become familiar with the characters and stories of the New Testament. My Gospel Friends is a great way for children in grades K–6 to become familiar with the characters and stories of the New Testament. Singing to the simple melodies, kids will learn about Jesus through stories of the people who knew him. They will enjoy listening to the songs performed by the 45-voice children’s choir at St. Jarlath’s School in Oakland, California. This collection is closely related to the Spanish-language children’s collection Evangelio Según Los Niños I by Spanish composer Mariano Fuertes. My Gospel Friends uses the same music as the Spanish collection; English lyrics based on the topic of each original song were written by Owen Alstott. Keyboard accompaniments have been added to My Gospel Friends and all tracks have been re-recorded. The CD both contains versions of each song with and without the children’s voices. 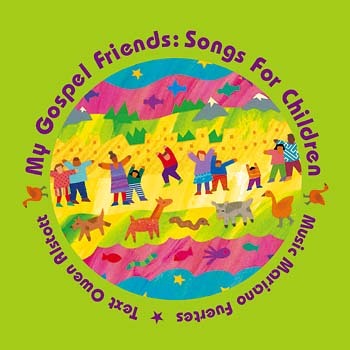 This 10-song MP3 album by Owen Alstott (lyrics), Mariano Fuertes, and Jack Miffleton (arranger/producer) features characters and stories from the New Testament sung by the 45-voice children's choir at St. Jarlath's School in Oakland, California. Additionally, this playlist includes instrumental versions of each song on the album. This collection is closely related to the Spanish-language children’s collection Evangelio Según Los Niños I by Spanish composer Mariano Fuertes. My Gospel Friends uses the same music as the Spanish collection; English lyrics based on the topic of each original song were written by Owen Alstott. Keyboard accompaniments have been added to My Gospel Friends and all tracks have been re-recorded. The cassette and CD both contain versions of each song with and without the children’s voices. This collection is closely related to the Spanish-language children’s collection Evangelio Según Los Niños I by Spanish composer Mariano Fuertes. My Gospel Friends uses the same music as the Spanish collection; English lyrics based on the topic of each original song were written by Owen Alstott. Keyboard accompaniments have been added to My Gospel Friends and all tracks have been re-recorded. The CD contains versions of each song with and without the children’s voices.